Is Your Salon Dust Free? If not, here’s why you should only use a Valentino Beauty Pure salon. When you walk into your favorite salon what is the first thing that you notice? Is it the fashionable style of the location that you love seeing? Is it mingling with your favorite technician while getting your nails done? A lot of times this is NOT the first thing you notice as you are ingulfed with that unpleasant odor or messy work area covered in nail dust while you are having your nails filed? Your monthly salon visit should be your place to help you “get away” and make you feel better through the style of your hair and nails that your stylist or technician artisticly creates and brings to life for you. The atmosphere is supposed to make you feel relaxed, comfortable, and a place to escape from your weekly stresses. Maybe this makes you think that this is “just the way it is” and if there was a way to fix it, you would expect the solution to be used? Well, there is now a solution to these issues that are now being brought to light more and more everyday. If you have never heard of Valentino Beauty Pure; here are the quick facts you need to know. Valentino Beauty Pure manufactures source capture systems for the nail industry. In business since 2010 Valentino Beauty Pure has successfully created a “Dust Free Life” for thousands of salons globally. Valentino Beauty Pure can be found anywhere in the world from the United States, to Europe, to Japan. What is a source capture system? Simply put, a source capture system utilizes a fan to to create suction collecting nail dust and absorbing odor through the use of a filter. At the source means that the system works right where the work is being performed not allowing it to escape into free air. All salons needs to have air cleaned and actually new laws in the United States are now requiring a source capture system. What makes Valentino Beauty Pure the best? State laws require a minimum of 50 CFM (The measurement for air flow) per station. 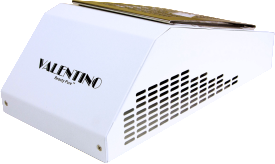 Valentino Beauty Pure greatly excedes this specification by inorporating a 293 CFM fan into their systems. To truely get the suction required to remove nail dust and odor a fan of this quality needs to be used. The air is drawn down by the fan through a filter with 200% carbon which was developed specifically with nail applications in mind. Valentino Beauty Pure offers two systems, a table-top model the GEN III S and a table-insertion design the Flush Mount XL which easily installs in any table. It seems these days that everyone is becoming more conscience of a healthy living style. Tools are being developed everyday that tell you everything from what you can eat to when you should go for your morning run. Over the last 20 years since the 1990’s there have been many health concerns brought to the beauty industry. Acrylic toxicity and lung damage through the inhalation of nail dust have all been known issues. Afterall, this is the beauty business isn’t it? As a consumer you expect that the professional you rely on and trust for your fashionable style is updated and knowledable on the best products available. Just as technology expands and improves everyday so do products used in the beauty industry. New products are developed everyday and you should expect nothing less than for your stylist or technician to test and use these products to ensure you leave a happy customer everytime. How would you feel if you knew that your computer repair specialist recommended an iPhone 4 to you when the iPhone 6 was just released? The same concept needs to be brought to the salon. Have any questions about Valentino Beauty Pure? Email us anytime at support@valentinobeautypure.com. We would love to hear from you! Copyright © 2019 Valentino Beauty Pure.